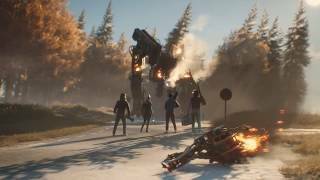 The premise of Generation Zero certainly sounds distinctive, and seems like it would have the potential to create something rather memorable. The game takes place in 1989, in an alternate history version of Sweden. From a brief text that appears on screen (as there are no cutscenes), we learn that Sweden managed to escape World War 2 unscathed, and in return the nation has prospered. At the same time, the authorities wanted to ensure that their people will always be safe, so everyone had to undertake military training, if they ever needed to defend themselves. Bunkers were built everywhere, and all families had small stockpiles of provisions and ammo. This scenario is definitely unique, and it also does well to explain why you will find supplies all over the game world, even in civilian homes. Players assume the role of a young person, whose look and clothes you can customize, having returned home from a vacation. The game begins immediately as you step on the shores of your home island, and things look strange. There are no signs of life anywhere, as an eerie silence hangs above the coastline. You begin to explore the nearby set of homes, finding that the lights have been left on, with personal belongings and cars are scattered about, but everyone seems to have gone in a hurry. It's not long before you come face to face with a strange machine, a dog-like Runner. Having picked up a pistol and ammo in the home, you are able to dispatch it. From here, you are completely free to explore the huge open world island, try to find what happened to the people, and learn more about the machine threat. 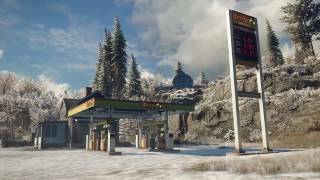 By far one of the most promising aspects of Generation Zero is its game world. The island is absolutely huge and with no means of transport, you could spend a very long time trekking across it on foot. On the one hand, yes it can seem tedious, however the game lets you see the entire map from the get-go, as well as all the buildings. This somewhat eliminates any sense of discovery, but on the other hand you can know exactly in which direction to head for the next town, or mysterious structure in the middle of the woods. Simply wandering through the island's wilderness is calming and serene, with a day/night cycle and occasional stormy weather creating a striking sense of atmosphere and a very varied color palette. The texture work and animations are decent enough for a game in this lower price range, and aren't bad enough to detract from the overall impressions. A quiet but fitting soundtrack is always there, letting you drink in your surroundings. When firefights occur, the silence is satisfyingly interrupted by the huge booms of your shotgun or distant explosions caused by your silenced rifle. On the whole the sound design is quite impressive and varied. The strong sense of atmosphere could let you mistake this game for an open world version of Firewatch, Dear Esther, or Everybody's Gone to the Rapture. As you visit new locations, safe houses scattered around the world allow for fast travel. As nice as the atmosphere is, try to imagine a walking simulator that's been stretched across a huge landmass. There's just not that much to do or see, especially as you start to realize that there is a ton of asset reuse. Every town you visit will have a bunch of different looking buildings, but their exterior and interior layouts will be very similar, something akin to PUBG. Varying colors and furniture layouts can't hide the fact that there are just a few different models of homes being duplicated. At first, the level of interactivity is addicting – you can open doors, turn lights on and off, open each car door and trunk, all in search of loot bags. But after a while, with the loot locations being randomly generated and the similar layouts of homes, it begins to lose its appeal. And again, like PUBG, some houses have literally nothing to offer due to randomization. As such, you could spend over 4 hours in the game's starting area, letting your sense of addictive exploration and interaction run its course, but after that you'll probably want something worthwhile to do. Generation Zero tries to move the player along by offering missions to complete. Somewhat similar to games like DayZ, there is no handholding of the player. Right off the bat you're free to walk anywhere in the game world, which can seem a bit overwhelming, so the game offers missions that you discover by visiting certain locations and homes. Most of the missions tie into small bits of environmental storytelling by letting you read letters and listen to voicemails, and adding relevant details to your log. You're very rarely given an exact location to visit, instead you must read the text and figure out where to head on your own, based on either direction or region name. Even if you are told the name of the town, you need to visit it first before the name is revealed on your map. This approach is similar to what last year's Assassin's Creed Odyssey offered. On the one hand, this again adds to the immersion factor and fans of complete immersion will be thrilled; on the other hand, the instructions are often unclear, and you have no choice but to wander the town until you find the correct item to interact with. The few times the game does offer a GPS heading to the next quest objective, it can be buggy. The quests themselves are not all that interesting, as they mostly lead the player to find crumbs of the overall narrative. And the way you find new quests can also be missed entirely, if you decide not to search yet another similar looking house, which just happened to have the start of a quest in it. Due to the huge size of the game world, the pacing slows down to a crawl. You could have many missions in progress, but no real desire to follow up on any specific one because they are all so similar. They mostly need you to find a location/town, and interact with a few items, after probably clearing the area of machines. Even missions directly related to the main story turn out to be dull, like trying to repair a radio and call for help to anyone outside of the island. The desire to find out the truth behind why and when everyone was evacuated, and where the machines come from, begins to fade as you realize the many, many hours of walking that lie ahead, and the underwhelming reveals that are drip-fed to you via plain text. But of course, as the opening alludes to, this is not just an exploration game. Combat with the machines takes up a notable amount of time, and things get a little clunky here. When interacting with items, you need to aim at a certain angle and be within a certain range for it to work. While the controls are fine for just walking around, getting into combat reveals that you're not as nimble as you'd like to be. You can only walk, jump awkwardly, crouch and sprint – there is no vaulting (which means fences and hedges can be death traps), no leaning, and no going prone. You'll get stuck on the environment plenty, usually at the most important moments. Weapon handling also feels off, and not as precise as you'd like it to be – an unfortunate fact, given that a lot of the combat relies on learning and specifically targeting enemy weak points. The enemies you'll be facing off against are about 6 different machines types that roam the land. They are most often found around locations of interest, rather than randomly in the wilderness, so you can at least traverse in peace most of the time. As mentioned, Runners are dog-like creatures that will attack from afar with a machine gun, and also try to tackle you (resulting in a needless awkward third person falling down animation). Ticks are small robots that will jump at you like Half Life Headcrabs, and can explode when near. Seekers are floating robots that can't attack but will sound alarms and draw others to your location. Then there's the more challenging and larger Hunters, who carry devastating machine guns, can deploy Ticks, and perform powerful melee strikes. The late-game Harvesters and Tanks are huge chunks of metal death that are best avoided until you've got enough devastating weapons and ammo to take them down. All of the robots come in a few different variants which alter their look and attack functions. Taking down these machines, big or small, is a matter of putting enough bullets into them. This can be quite a challenge and take a while, if you're playing solo, so the best approach is to plan your attacks carefully and learn enemy weakpoints. The robots have fuel cells and other juicy targets that cause massive damage, but of course they can be well hidden or protected by plating. As mentioned, the controls don't feel all that precise, so aiming at the right spot can be tricky – not to mention that most of the robots are quite mobile and don't often stand still. And even if they do, they are putting a ton of firepower on you, again shaking your aim and draining your health quickly. Until you unlock a skill many hours into the game, there are no UI elements to keep track of enemies. Despite what the game and its developers promise, Generation Zero is not balanced for solo play, and it's much easier to tackle big threats with the help of co-op partners. There's also the idea that stealth can be utilized in order to get things done, for exploration and missions where eliminating machines is not required. However, that approach is not worth your time. Stealth mechanics are often problematic even in the bigger budget games, and in Generation Zero they are downright broken. There is no rhyme or reason of how enemies detect you – it could be vision, or it could be sound; the game never makes it clear. You could be crouched at night in the middle of a field, or you could be exploring a deep underground bunker, and somehow enemies above will detect you and freak out. You could be scavenging for supplies in a barn, with all doors closed, and yet enemies nearby will very soon become aware of your presence. There is a very basic indicator of enemy awareness and their direction, but it's entirely useless. It can only track one enemy at a time (presumably the closest), and it randomly gives up altogether and disappears, leaving you without any help in the heat of battle. So there's always going to be a fight, and you can at least prepare by utilizing some guerilla mechanics. Players can deploy flares that disrupt the aiming ability of the machines, or make them focus their attacks elsewhere. You could also throw a few gas canisters on the ground next to a radio, which will bring unsuspecting machines to their demise. There are also batteries and EMP charges that can confuse anything within their explosion range. However, with clunky inventory management, you're always going to be fighting a losing battle even when trying to setup these clever traps. Just as in stealth, the enemy AI in combat is questionable at best. Sometimes enemies will blindly follow a path to investigate your last known location, even if you run right past them on the way. They will glitch out plenty of times, letting you pick them off from a distance or from inside a structure. However, they can just as easily get glitched into your building, resulting in plenty of awkward situations. So you'll die plenty, and the only positive here is that you don't lose anything upon death – you can choose to resurrect right on the spot if you have an adrenalin shot, or respawn at a discovered safehouse and walk all the way back. To take down the machines, you'll need guns, and there are only a handful of types that can be found. There's a pistol, shotgun, SMG, assault rifle, rocket launcher, and sniper, with a couple of different models. It's not exactly a ton of options, and instead the game tries to stretch out your arsenal options by offering varying quality of the same weapons, from worn to good and exceptional. The appearance changes, but otherwise there's not a world of difference between the tiers. Weapons can be outfitted with designated attachments, like scopes and silencers, and a couple of different ammo types. You carry two weapons at a time plus a pistol, while the rest sit in your inventory. And that inventory is a chore to navigate. The layout is simple as a stack-based grid, but managing it is painful with a controller. There's no way to sort items or move them within your inventory, so you're kind of left with the game re-arranging things on its own. As you scavenge loot boxes and backpacks, you'll most often find tons of ammo, so there's rarely a need to be conservative with your shots. Health does not regenerate at any point, and health kits are infrequently found. With no crafting or money system, it comes down to luck if you're ready for the next battle or not. Similarly, weapons are rare, but when you find duplicates or those of lesser quality, there is nothing to do but leave them behind. It wouldn't be an RPG without an experience system and skill trees, and this game has a basic implementation of both. You earn experience from combat (whether you win, die, or run away from it - which is nice), as well as from completing missions and discovering new locations. The rate of experience gain is very slow – probably about 1 level per hour of gameplay, and that entirely depends on your playstyle. If you choose stealth and avoiding machines, you'll be leveling up even slower. With each level you gain a skill point, with which you can unlock a variety of perks in one of three skill tree areas – better weapon handling, more health and inventory capacity, faster revival of teammates, and so forth. The perks are bland, and because of how slowly you gain experience, you don't really feel like you're making progress, slowing down the pace of the experience even more. By now it should be clear that many of the systems in Generation Zero feel underdeveloped. But there are more baffling decisions worth mentioning. For instance, despite the game's attempt to be a survival title, you will always be swimming in ammo and adrenalin shots, and yet few heath kits, meaning you'll always be on the brink of death. You can assign items to the D-Pad for quick use, like health kits or flares, but if you run out of them, the binding is cleared; even if you find more of the same item, you have to go though and assign it to the D-Pad time and again .The game also make a baffling choice to refill all loot in the game world after a day or so, meaning you could just loot the same town repeatedly. A similar but more annoying design decision is that machines respawn too. That means towns and safehouses will always force you into the same fights, over and over, and for subsequent victories you don't even get any loot from the defeated machines. Similarly undercooked is the co-operative multiplayer design – a rather shocking fact, given that the game is both promoted and balanced with online play in mind. The host of the co-op session is the player whose world state the game uses as the basis for any joining co-op partners. Because the quests often follow a linear progression, they have prerequisites, and in order for the quest to count as complete for anyone other than the host player, the others need to have it unlocked as well. What this means is that the only way to ensure all players can complete quests, and have their progress be saved, is to play only together from the start to the end. Any sort of drop-in play will likely mean the quests may not count when you return to your own world. If you're okay with that, and just want to level up your character some more and get more loot, co-op play seems to be decent and mostly lag-free. It's also the only way to enjoyably tackle the bigger machines. And yet still design annoyances creep up – the game spawns joining players at the very start of the game; from there you can fast travel to any safehouses you have unlocked, not the host, or you can ask the host to deploy a radio beacon to spawn on, which seems needlessly complicated. 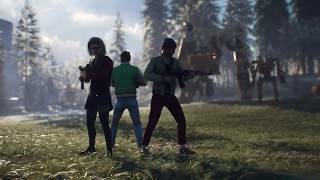 If you don't have any pals with Generation Zero, by default the game lets you know that your game world is open to other players, and you can join others as well without asking. You can be kicked, of course, and this happened quite a lot to us, as the community seemingly wants to enjoy this dangerous open world alone – again, amusingly going against the game's aspirations as a co-op focused title. The game also lacks a fair bit of polish. There are bugs everywhere – scripting issues that can leave you stuck or unable to progress quests, enemy issues that leave them frozen in place, or killing you with a weapon that glitched through a wall, and general world design issues with plenty of visible immaterial walls, invisible walls, floating objects, and so on. But by far the worst are progression tracking issues – it first warns of its presence when you try to look at your character statistics and see all blanks. Far more severe are the reported save corruptions, which we managed to avoid, but instead ran into another equally impacting issue. Following a co-op session, the game decided to overwrite our game world with the one that the co-op host was using. This means the entire 30+ hours of exploration was gone – and because the game's open-ended design lacks guidance, we'd have to somehow find all those quests again. At that point, it was time to throw in the towel. Generation Zero is a game that doesn't know what it wants to be, a strange hybrid that never manages to glue itself together in a convincing manner. It's a weird mix of a post-apocalyptic exploration adventure, with RPG elements and challenging combat, with a dash of multiplayer. It sadly doesn't succeed in any of these areas. Atmosphere and potential for an interesting world to explore is there, but after the opening 10 hours, you realize that the game is just too vast and yet features too little interactive content. The combat is tough and not overly satisfying, with the imprecise controls and odd design decisions like respawning loot and enemies. But above all, this is a broken game with so many issues – the primary ones being progress blocking or outright erasing – that makes it impossible to recommend, even for its nice atmosphere. A surprisingly immersive atmosphere thanks to decent texture work, day / night cycle, and solid soundtrack. The controls never feel satisfying, and the various means of dealing with machines are too awkward to execute. The AI is very basic and inconsistent. RPG elements are barebones, and inventory is a pain. A very slow paced game, but one that manages to capture the sense of exploration and adventure in an abandoned world – at least for a little while. Difficulty not balanced for solo play. Awkwardly designed, with progress tracking issues. When you do get connected, at least there's not much lag. Broken quests and scripting, buggy AI, invisible walls - you name it, Generation Zero has it. Losing progress hurts the most due to the game's freeform design. Generation Zero is an amalgamation of ideas, some of them pretty decent, but none executed with any great level of confidence. Despite the surprisingly strong atmosphere, gameplay annoyances and serious technical issues prevent it from having a chance to survive. Generation Zero is ranked #1397 out of 1435 total reviewed games. It is ranked #37 out of 39 games reviewed in 2019.